Phil Clarke has questioned whether clubs are right to support players accused of breaking doping rules in wake of Gabe Hamlin's suspension. And the Sky Sports pundit believes much tougher punishments - such as fining players half their annual salary - are needed to deter players from taking prohibited substances. Hamlin has flown home to Australia after being charged with a UK Anti-Doping violation. 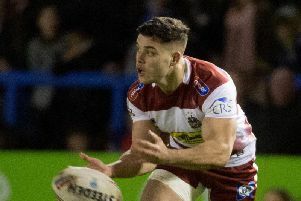 Details of his charge have not been revealed but it sparked a discussion about drugs in sport on Sky Sports ahead of last night's match. Warriors have made it clear they will support Hamlin during the process and thereafter. Ex-Wigan and GB loose forward Clarke said: "Why do clubs have to support players when they do the wrong thing? "We've gone completely too far the wrong way. There's a thing in general public called victim support, not criminal support - we bend over backwards to support players." Prop Hamlin has until Monday to inform UKAD if he wants to challenge the charge. Clarke sees his return home as "an admission of guilt". Following on from a number of other cases of players being banned for taking cocaine - such as Zak Hardaker, Thomas Minns, Rangi Chase and Adam Walker - Clarke said: "Lots of players have been banned for cocaine, the two year ban doesn't seem to have an affect. "Is it a fine? You'd obviously need the players to agree to this, (but) a 50 per cent fine if caught using drugs would be a massive deterrent - 50 per cent of their salary for that year they'd have to pay. "If it meant him losing his house, there might be a bit more serious consideration because losing your career for two years certainly isn't having an impact."